Here's everything you need to know about food mills and ricers, so you can pick the best tool for your kitchen. We’ve got nothing but love for our food processors and stand mixers, but there are often times when only the delicate touch of an elbow grease–powered piece of gear will do. Take mashed potatoes for example, which easily become overworked and gummy by the fast action of a stand mixer paddle attachment. This is one instance when simpler is better—I’ll take a fork to my potatoes before they ever see the inside of a food processor. If you want to step up you mashed-potato game, regardless of whether you like them fluffy or creamy, a food mill or potato ricer is your best bet. We already know that they’re ideal for breaking down potatoes without overworking them, but which one should you invest in? Here’s everything you need to know about each, so you can decide which one deserves a spot in your kitchen. 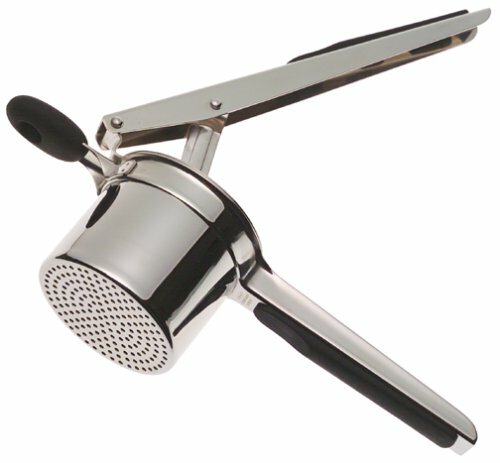 A ricer looks a lot like a giant garlic press and works in pretty much the same way. It comes equipped with a perforated hopper, where you place your cooked food before applying pressure with a lever, which forces the food through the small holes. The tiny holes are about the size of a grain of rice, hence the tool’s name. Unlike food mills, stand mixers, or even the humble potato masher or whisk, the potato ricer breaks down a potato into a smooth and fluffy mash while only rupturing the cells once as they pass through the perforated base. This ensures that they won’t get overworked and gummy, and instead remain fluffy and light. It’s just the tool you need for light and fluffy gnocchi or this creamy and crispy make-ahead mashed potato casserole. As a bonus, a ricer is simple to use and clean, with few moving parts and little assembly required. It’s a cheap hand tool that you can easily nestle into a large drawer or tuck away inside any cabinet, making it a no-brainer addition to any kitchen. What we don’t like about potato ricers: The potato ricer, as the name suggests, is designed to work on potatoes. Though you can press other soft food items through it to make simple purées, most other vegetables need something a little more forceful to break down their tough fibers and cell walls. Unfortunately, that makes a ricer a unitasker, best suited to homes that really love their mash. It’s also worth noting that the hopper of a ricer can only handle the flesh of about one potato at a time. This is sufficient for day-to-day use, but can really slow your roll if you’re looking to prep larger quantities for the holidays or a special event. A food mill both purées and strains soft items, like boiled potatoes or tomatoes, in one shot. It has a simple construction, consisting of a bowl fitted with a hand crank that rotates a plate, which forces food through a perforated base. Many models offer interchangeable bases with variously sized perforations for smoother or coarser purées. It goes above and beyond smooth potatoes: it removes seeds from fruit for jams, skins from peppers in purées, and is the key to everything tomato. Fresh tomato sauce is easier than ever with a food mill, which will discard skins and seeds while reducing the flesh into a smooth pulp. A food mill can also be a good buy for two very different kinds of cooks: the one who has it all and really wants to make Michelin-starred purées and mash, or the minimalist who’s looking for something instead of a blender or food processor. What we don’t like about food mills: There are several drawbacks to owning a food mill, including the fact that it can be big, bulky, and pricey. Unlike a dainty ricer, there’s no drawer that could house a food mill. The interchangeable plates can also be difficult to assemble, disassemble, and clean*, making it too fussy a tool to grab for a quick weeknight dinner. * The best way to clean a food mill is immediately after you use it! Immediately! In a review by Wirecutter for the best potato masher, they found that tasters didn’t like the uber-smooth, almost soup-like quality of mashed potatoes made in a food mill. The potatoes processed in it will yield a mash that definitely leans closer to a French pommes purée. Daniel also argues that food mills made for home use can often be flimsy and difficult to use. He recommends going pro and opting for a commercial food mill from a restaurant supply store. These are larger and more expensive, but they are sturdy and can easily process large batches of soups and purées. It all depends on the specific needs of your kitchen. If all you care about is spuds and space, go with a potato ricer; if you want it all, and have the space and the cash, then make a splash and pick up a food mill.